SWAN Districts ruckman Nathan Blakely has paid tribute to teammate Kirk Ugle ahead of his 100th WAFL game as he prepares for another tough battle in the ruck against South Fremantle on Saturday. 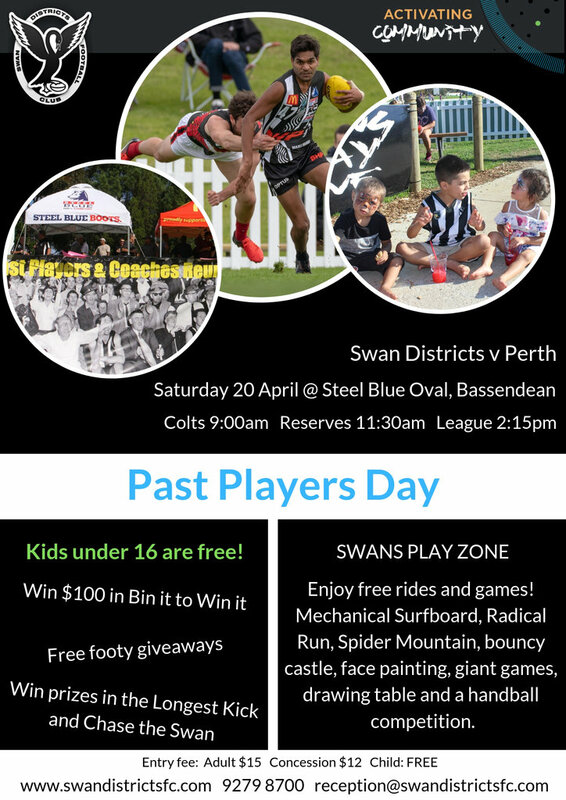 Swan Districts return to Steel Blue Oval on Saturday to take on South Fremantle and not only does that mean for Blakely a battle up against the Bulldogs' State ruckman Brock Higgins, but the black-and-whites will be celebrating the 100th WAFL game of Kirk Ugle. 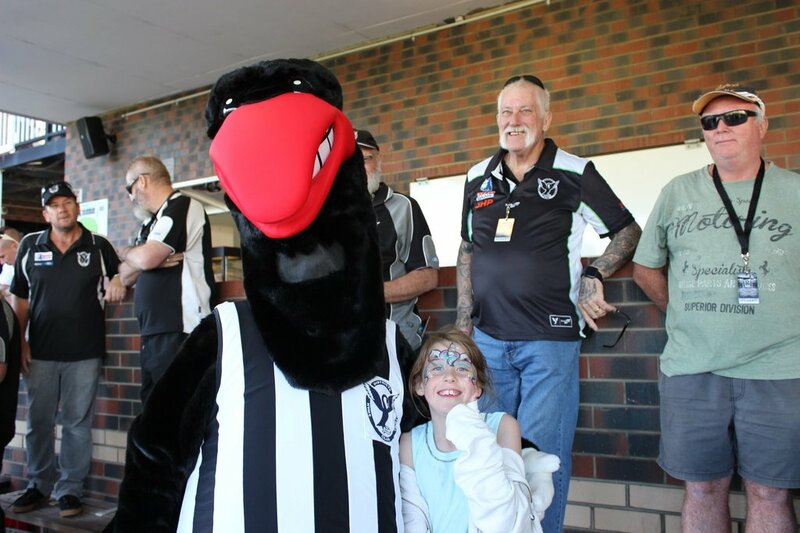 Ugle originally joined Swan Districts to play colts football having come through the ranks at Carey Park in Bunbury, which is where Blakely first came into contact with him. The talented left-footer went on to get drafted to Collingwood where he went on to play three AFL games in 2012 before return home to Swan Districts in 2013. Ever since he has cemented himself as one of the best small defenders in the WAFL both in terms of playing on dangerous opponents and providing run and carry out of the back-line. He's played State football as a result and now this Saturday against South Fremantle at Steel Blue Oval brings up his 100th game to book his name on the No. 6 locker. Blakely is proud of Ugle as much for what he's done on the football field as for what he's done through some remarkably challenging times away from the game in recent years. "I was lucky enough to play against Kirk as a junior and I was no good kicking around in Bunbury, and he was already the best player in three age groups playing for Carey Park," Blakely told 91.3 SportFM. "I remember him one day running the whole length of the field in an under-15s or 16s game where he went from full-back to full-forward and kicking a goal. You knew then he was going to special and he's had to go through so much with his mother and dad unfortunately passing. "He's raised his young sisters and his whole family have become amazing people and really respected members of the community. He's also had this opportunity to play football at the highest level and still raise a family. "He is one of the most loved guys around Swans supporters are lucky to have him, and Bunbury, Swan Districts and the Indigenous community should be really proud of Kirk." 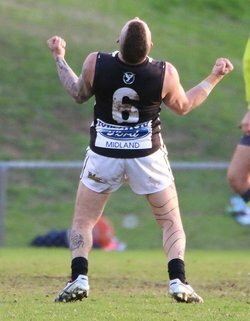 As for Blakely, he is having a strong season in the ruck for Swan Districts having missed the past two years firstly through a knee reconstruction and then also deciding to sit out all of 2017. He had a fascinating duel last Saturday in Swans' loss to Subiaco against former Fremantle big man Zac Clarke and was happy to contribute around the ground strongly with his 19 possessions, 28 hit outs and four tackles. "You don't get too many easy days as a ruckman in the WAFL at the moment, every team seems to have a pretty seasoned veteran and obviously Zac Clarke played 101 AFL games and if things went his way with injury, he'd still be on a list now and he might be again next year," Blakely said. "He won the hit out battle which often happens, but my team expects me to do well with my follow up work and tackling, which I feel I gave the team. "I've been finding a bit of the ball this year so I've been happy with my performance. Zac and I have known each other for a while and we even got into a bit of a fight at one stage, but luckily I didn’t swing which looked bad on the Sunday I must admit." Things don't get any easier this Saturday when Blakely comes up against South Fremantle's 118-game veteran Brock Higgins who led the WAFL State Team in the ruck earlier this year to the win in Adelaide over South Australia. Blakely is looking forward to another significant challenge. "He's the state ruckman and is another guy who did his time in the twos at East Perth and has become a really seasoned, veteran WAFL player," he said. "Every week you are coming up against a bull and Brock is quite different from Zac. But I look forward to Brock and hopefully running around and trying to have just as much influence, and trying to minimise his impact inside which is one of his strong suits." Looking back on last week's 52-point loss to Subiaco, Blakely was proud of the first half Swan Districts delivered to hold the Lions to their only goalless quarter of the season in the second term. But ultimately it was the depth and consistency to perform for longer that stood out as why the Lions were able to come out and kick the opening eight goals of the second half. "It was another one of those wet days which we've had a fair bit of the last six weeks. The first half I was really proud of the boys and we stuck it to them and we were only a couple of points short going into half-time and we went in feeling really confident," he said. "But that's a well-drilled, physically mature bodied team in Subiaco who just know how to get the job done and they ran over us in the second half. On Monday night, Pickers was saying how proud he was of us and we just had a little bit of a Powerpoint looking at some stats in terms of games played at the club. "The big difference is we have lots and lots of young kids coming through at the moment who will be really good players, but Subiaco's squad as a whole pretty much have all done their time in the twos and have done their apprenticeships. "They've all had a couple pre-seasons under their belt either in the AFL or reserves level and even in their reserves, they had guys like Clancy Wheeler, Ray Daniels, Adam Cockie running around who can't even get a game at the moment. They are just a well-run club and everyone is striving to be them at the moment." Whether or not Swan Districts are able to still compete for a finals spot in 2018 or not, Blakely is excited by what the future holds at the club with so many young players getting their opportunities at league level. "We just have so many young players like Patty Italiano, Jarrod Cameron, Will Reidy, Tristen Raynor, Alby Dean, Jack O'Sullivan, Brayden Hackett, Graydon Wilson, Tobe Watson and Ethan Maguire," Blakely said. "All these young core are 22 or less and having a huge impact at Swan Districts and will be the players in three or four years who can take us to a flag. Even Jesse Turner is still so young but already an established WAFL midfielder."